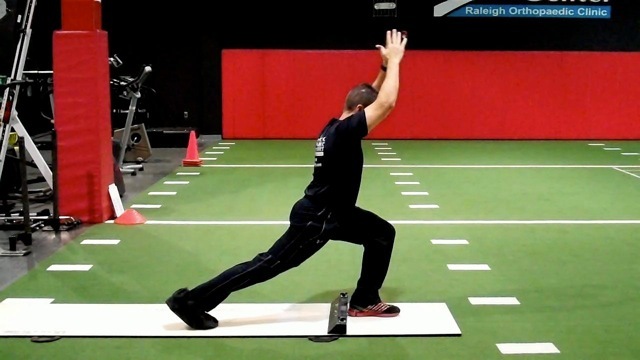 In my last column, I covered lunges with rotation and the implication for rotational control in athletes. Training clients with anterior knee pain is another common issue confronting many trainers. In many cases, valgus knee collapse and poor transverse plane control contribute to abnormal kinetic chain motion. Additionally, loaded exercises and asymmetry can make traditional exercise ineffective and painful or dysfunctional. Common exercise prescriptions call for quadriceps, glut and hamstring strengthening, but finding a way to improve neuromuscular control of the core, hip and knee without causing knee pain is a must. 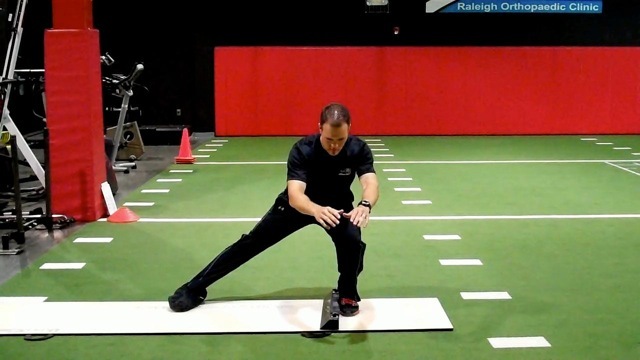 This exercise will demonstrate an effective way using a slide board (or sliders/gliding discs) to improve strength and closed kinetic chain alignment. Reverse Sliding Lunge (pictured right below) - Begin with one foot forward (heel against the edge of the slide board) and the other on the board. As you slide the rear foot backward, bring the arms overhead while maintaining neutral alignment of both feet (pointing forward). The knee should point forward over the second toe. Pause at the bottom, and then return to upright. Perform 1-2 sets of 10-15 reps on each side. The nice thing about using the slide board is that you can lock the front heel in to better direct the focus on the trunk, core, and rear leg's hip and knee. Lateral Sliding Lunge (left below) - Begin with one foot on the outside of the board (braced against it) and the other foot on the board. Slowly allow the outside leg to slide away from the body until you have reached maximum stretch of the groin or to the point just before balance and proper trunk, hip or knee alignment is lost. Pause at the bottom and return to upright. Perform 2 sets of 10-15 reps on each side. These exercises are effective in injury prevention and rehab programs for those with anterior knee pain as well as athletes participating in field or court based sports. I utilize the reverse lunge to help engage the gluteus maximus and hamstrings, while I prefer the lateral lunge to kick in the gluteus medius and hip adductors. For those without a slide board, simply use a Val slide or gliding disc to do the same movement. A slower cadence on the eccentric portion of the exercise is preferable to maximize stability and strength gains. However, do not force through any painful ranges of motion. Proper control and alignment trumps depth and exercise volume as layering a poor neuromuscular pattern will only further perpetuate altered motor control and dysfunction. Anterior knee pain of patellofemoral pain syndrome is a prevalent issue in many females. Eliminating soft tissue tightness in structures such as the TFL, hamstrings, and IT band is important for reducing lateral compression of the patella in many cases. Beyond joint pain, keep in mind that hip/knee alignment and a client's activity/injury history also play a critical role in exercise selection, loading and volume.